What if a single revelation like a single choice changed everything? What if love and loyalty made you do things you never expected? The faction-based society that Tris Prior once believed in is shattered, fractured by violence and power struggles and scarred by loss and betrayal. So when offered a chance to explore the world past the limits she's known, Tris is ready. Perhaps beyond the fence, she and Tobias will find a simple new life together, free from complicated lies, tangled loyalties and painful memories. But Tris's new reality is even more alarming than the one she left behind. Old discoveries are quickly rendered meaningless. Explosive new truths change the hearts of those she loves and once again, Tris must battle to comprehend the complexities of human nature and of herself while facing impossible choices about courage, allegiance, sacrifice and love. 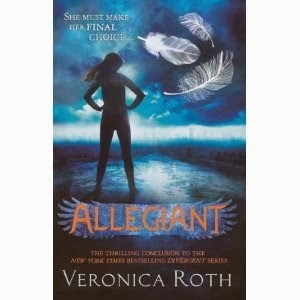 Told from a riveting dual perspective, Allegiant, by No. 1 New York Times best-selling author Veronica Roth, brings the Divergent series to a powerful conclusion while revealing the secrets of the dystopian world that has captivated millions of readers in Divergent and Insurgent. Veronica Roth is the No. 1 New York Times bestselling author of Divergent and Insurgent, the first two books in the Divergent trilogy. Now a full-time writer, Ms. Roth and her husband live in Chicago. You can visit her online at Twitter, Tumblr, her blog and her website.